30 Ways to Have Some Computer-Controlled Evil Fun! This wickedly inventive guide shows you how to program and build a variety of projects with the Arduino microcontroller development system. 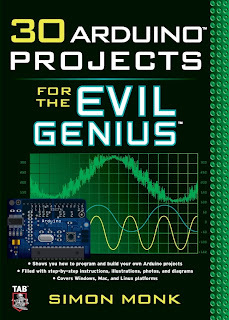 Covering Windows, Mac, and Linux platforms, 30 Arduino Projects for the Evil Genius gets you up to speed with the simplified C programming you need to know--no prior programming experience necessary. Using easy-to-find components and equipment, this do-it-yourself book explains how to attach an Arduino board to your computer, program it, and connect electronics to it to create fiendishly fun projects. The only limit is your imagination! 30 maneras de pasar un buen rato mal controlado por ordenador! Esta guía de malvada la invención que muestra cómo programar y construir una gran variedad de proyectos con el sistema de desarrollo Arduino microcontrolador. Cubriendo Windows, Mac y Linux, de 30 Proyectos Arduino para el Genio Malvado que se levanta al día con el procedimiento simplificado de programación C que necesita saber - no es necesario experiencia previa en programación. Uso fácil de encontrar componentes y equipos, este hágalo usted mismo el libro explica cómo conectar una placa Arduino a su equipo, que programa, y conectar la electrónica para crear proyectos endiabladamente divertidos. El único límite es tu imaginación! Quickstart. Powering Up. Installing the Software. Configuring Your Arduino Environment. Downloading the Project Software. Flashing LED. Breadboard. Summary. A Tour of Arduino. Microcontrollers. What’s on an Arduino Board?. The Arduino Family. The C Language. Summary. LED Projects. Morse Code S.O.SFlasher. Loops. Arrays. Morse Code Translator. High-Brightness Morse Code Translator. Summary. More LED Projects. Digital Inputs and Outputs. Model Traffic Signal. Strobe Light. S.A.DLight. High-Powered Strobe Light. Random Number Generation. LED Dice. Summary. Sensor Projects. Keypad Security Code. Rotary Encoders. Model Traffic Signal Using a Rotary Encoder. Sensing Light. Pulse Rate Monitor. Measuring Temperature. USB Temperature Logger. Summary. Light Projects. Multicolor Light Display. Seven-Segment LEDs. Seven-Segment LED Double Dice. LED Array. LCD Displays. USB Message Board. Summary. Sound Projects. Oscilloscope. Sound Generation. Tune Player. Light Harp. VU Meter. Summary. Power Projects. LCD Thermostat. Computer-Controlled Fan. H-Bridge Controllers. Hypnotizer. Servo Motors. Servo-Controlled Laser. Summary. Miscellaneous Projects. Lie Detector. Magnetic Door Lock. Infrared Remote. Lilypad Clock. Evil Genius Countdown Timer. Summary. Your Projects. Circuits. Components. Tools. Project Ideas. Appendix Components and Supplies. Suppliers. Starter Kit of Components.